MANHATTAN — Are you looking for an apartment building that comes with a little extra help? These three apartments, two in Manhattan and one in Brooklyn, are all located in buildings that offer doormen and concierge service. Open House: Sunday, Nov. 15, noon – 2 p.m.
Lowdown: This junior one-bedroom apartment has been converted from an alcove studio. “For a one bedroom, it's better in price,” said Spire Group broker Bianka Yankov, who said she received 40 inquiries about the unit the first 48 hours it went on the market. Entering the front door, there's an arched entryway to the bedroom. The current owners separate the bedroom from the foyer by a curtain. Inside the bedroom and the rest of the apartment, the owners installed soundproof windows to keep out noise, according to Yankov. “The apartment is on the second floor so the windows have treetop views,” she said. A galley kitchen has granite countertops and stainless steel appliances. It was upgraded about three years ago, said Yankov. The open living and dining room have enough space for both a couch and dining room table. The co-op building, where Yankov is a shareholder, has 24-hour doorman and concierge services. “It's one person who does both jobs,” she said. There's also a furnished roof deck, recently upgraded fitness center, laundry room, garage and storage room. Location: “The building is squeezed between Nomad, Murray Hill and Gramercy,” noted Yankov. It's about five blocks north from Gramercy Park and three blocks east of Madison Square Park. The closest subway line is the 6 train at either 23rd Street or 28th Street. Why put it on your open house calendar? “It's pindrop quiet and there are very low monthlies,” said Yankov. Open House: Sunday, Nov. 15, 2:30–3:30 p.m. It's a corner unit with windows that face south and west. Because it's on the 20th floor, you get views of the Empire State Building and down to the World Trade Center. The master bedroom, which he called “graciously sized,” is separated into three sections. There's the bedroom area, which can fit a king-sized bed and is lined with closets, then a walk-in closet, then the master bathroom. The seller, who has lived in the apartment for a long time, has put in new floors but the rest of the apartment is in its original condition. “It will need a reno,” said Lilly. The building, converted to a co-op in 1979, has a full-time doorman and concierge. There's also a roof deck, gym, bike and storage rooms. Location: The building is located between Lexington and 3rd avenues, meaning that there's plenty of bars, restaurants and cafes nearby. While the closest subway line is the 6 at 33rd Street, it's only about a 10 minute walk north to Grand Central, where you can catch the 4, 5, 6, 7 and shuttle trains. Open House: Sunday, Nov. 15, 1:00 – 3:00 p.m.
Lowdown: This fifth floor studio is unique in that there are “full harbor views,” said Corcoran broker Phyllis Elliott. There are some original features of the 1928 building left as is, like the 13-foot ceilings and two concrete pillars in the foyer. Modern details include electric remote-controlled window blinds and an Italian-designed open kitchen. The “large, expansive living space,” as Elliott called it, could accommodate a bed and living room furniture. The current owners have their bedroom in the office, which does not have a window. There's a double closet in the office as well as the entryway, she noted. Condo amenities include a morning shuttle to the subway that leaves every 20 minutes, gym, fitness rooms, game rooms and an outdoor putting green. There's a live-in resident manager, doormen, valets and concierge. “The building staff is there to serve you,” said Elliott, who added that there's a freezer and fridge in the lobby for your grocery deliveries. Location: 360 Furman Street is well-known for its location right at the end of Brooklyn Bridge Park, outside Pier 6. 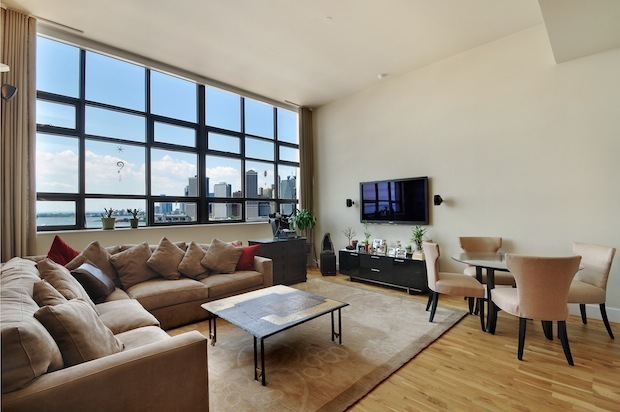 Besides all the waterfront park space, it's an easy walk into Brooklyn Heights or Cobble Hill. The closest subways are a 10 minute walk away. There's the 4 and 5 trains at Borough Hall, the A, C and F trains at Jay Street/Metrotech and the N and R at Court Street.